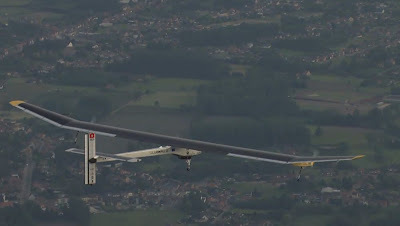 The pioneering aircraft took off at 1637 GMT in cloudy conditions, according to images shown on its website www.solarimpulse.com. Heavy rain and strong winds had prevented it from taking off at 0230 GMT as scheduled. This time, the high-tech plane is expected to rise around 2,500 metres in altitude. The flight is being transmitted live on www.solarimpulse.com. The Solar Impulse team is aiming to make possible transamerican, transatlantic and round-the-world flights -- in stages -- in 2013 and 2014 using a slightly larger aircraft.